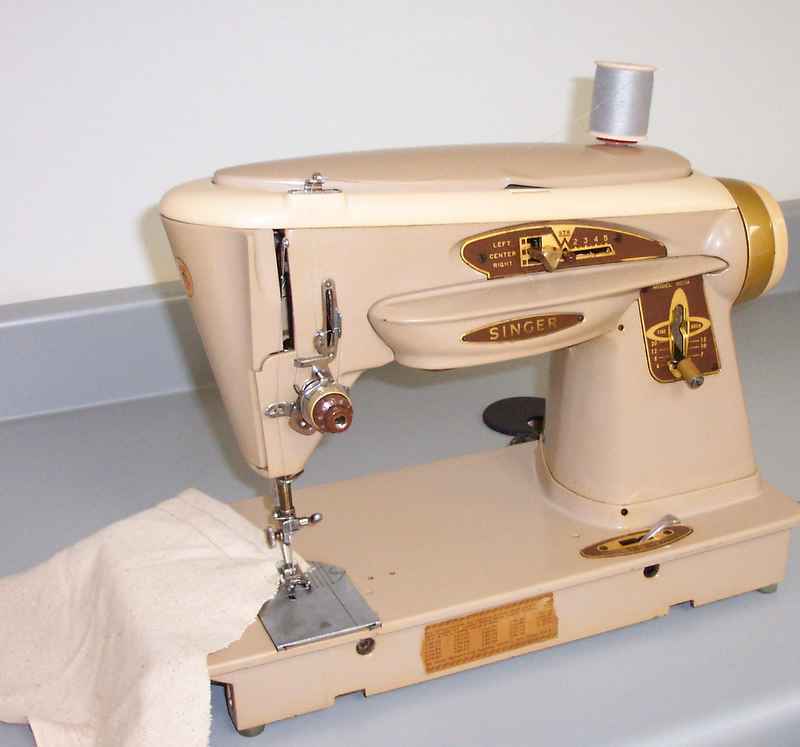 A question was asked recently on one of the internet sewing discussion lists: Did anyone learn to sew using a 50's era Singer sewing machine? Yep! I did! It's still my favorite machine....I use it every day. The one pictured here is a model 503, nicknamed the Rocketeer because of it's (then) ultra modern design. My father bought it as a gift for my Mother, who loved the machine, but procalimed, "....Don't ever get me another household appliance as a gift again. " Mom was a diamond/silk kind of gal, and although a wonderful seamstress and tailor, she none the less considered a sewing machine as a needed household appliance, not a gift to be associated with romance. LOL! Very cool, Pam! I always knew you were the high-flying type. Hope Roger takes the hint. I agree with your mother Pam about receving household appliance as a gift. And I think a sewing machine will be the same for me. Even thought I like to sew it is work. I prefer to read so reading sewing book would be more relaxing than sewing. I just read your article in Janet Pray's newsletter and was prompted to visit your website, where I was captivated by the Rocketeer. That's the machine my mother still uses, and I've made it clear to her that I would love to have the machine should she decide to pass it along some time. Mom received it as a present in the very early 1960s and used it in a home dressmaking business for years. Although my current machine has more bells and whistles, nothing has the solid feeling of the Rocketeer. Enjoy! I just purchased one of these last year for $75. I have yet to "fire it up" and go. I need to read the instruction manual and get going,as I really want to use it for quilting. I also have a Singer Featherweight. Let's not forget my 180e, and my 2500DCET serger. Lots of equipment. I should be sewing up a storm! I am getting back into it, after about a 2 yr break, it's time to get to using some of my stash. I love how solid this machine feels, when I have run it to try it out. Oops, almost forgot about the Singer in the trunk of my car that I found on the curb. It's a 70s Touch and Sew straight stitch model. When it tested it by hand, it was smooth as silk as far as running goes, I don't recall the model number right now. Guess it's time to haul it in from my car and give that one a test drive too!! This is the machine my mom has! She always complained that it was never quite right. When I took up sewing to save money on a dress for my then 2 year old daughter to march in a wedding with, I struggled on my mom's machine and got so fed up I decided to buy one. It was a Viking for $450, which I still love, but I sure didn't save money on that dress! I'm working on my sewing skills since I'm relatively new to the sewing game. I'm glad I found your site through blogexplosion. I swear we had a Rocketeer also, a replacement for the old black Singer we previously had. In 1964, Mom traded the 503 in for a "fancy stitch" Singer that never worked well at all. A few years ago a machine repairman told me that we must have purchased a lemon, because he had one in the shop that worked great, and sure enough it was the same model. At the time we had that Singer, one of the early decorative stitch machines, I wished we still had the 503. Today, I have a Viking #1+ (not top of the line any more) which I absolutely love, and a 150 stitch Kenmore and a Viking serger, but I still love the looks of the Rocketeer. I'm a product of the Slantamatic also. It was given to my mom about 1960 and I learned to sew on it. I later inherited it, sewed on it for many years, and in the last few months passed it on to one of her grandchildren who was anxious to learn to sew. There's nothing like 'passing it forward'! Many repairmen told me to never part with it as it was one of the last of the great all-metal gear machines and runs like a top! It was a good machine, but not as good as my Bernina 930 (my favorite) and 180e. I love these machines so much so that I have 20 something and that is all I am admitting to owning! I started a group for Singer Slant-O-Matics just to find out how to maintain and repair them. I was elated to find I wasn't the only one that loved these wonderful machines. My third machine was the 401A and as the first stitch formed I fell in love. It is now Jan 21, 2007. Please update. Did Roger take up on the hints? Happened upon the "Rocketeer" photo and text. The 501-A similar Singer made it's way back to me in 2005. I bought it, circa 1990, for my daughter who was ISO of a "used" machine. It was w/o cams or manual. Have since purchased a copy thru sewusa.com. Eventually daughter was gifted with a new Kenmore and stashed the Singer. In the course of her family doing a major remodeling, the Singer came back to me. It went in for service after the lengthy layofff of use and is now enjoyable to use by me when I am where it is. i just got my rocketeer in the mail today from a fellow nurse who lives in virginia. how cool is it that i found your blog today?! I bought a 503-A over 20 years ago at a church rummage sale for $15 and have never thought once about getting a different machine. I recently bought one for my girlfriend who has taken up sewing. She has been frustrated trying to use her fancy new Singer machine (lightweight plastic crap) as she was getting poor results. She's so much happier working with old Slant-O-Matic - and getting better results too! I just bought the 503A and I am trying to find out all I can about this machine. Sounds like I picked a winner.